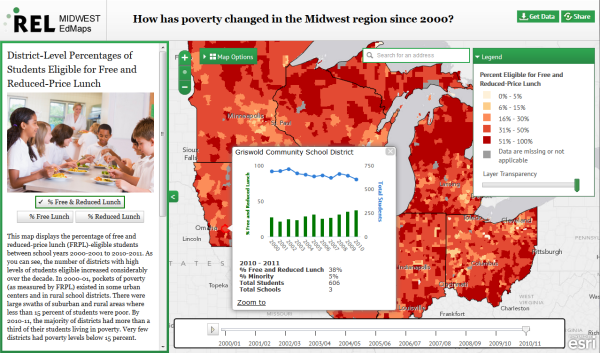 How has poverty changed in the Midwest region since 2000? This question as well as others related to education priorities in the Midwest can be answered with the REL Midwest’s newly launched EdMaps. EdMaps is a mapping application that displays educational data as “story maps” with the focus of building knowledge across the REL’s four educational priority areas. Built by Blue Raster, EdMaps helps users analyze publicly available school- and district-level data, observe trends over time and frame conversations on practice and policy. In its initial debut, EdMaps includes story maps on graduation rates and poverty levels and future releases of the application will allow a choice of data to overlay and compare over time. We believe that education stakeholders throughout our region will benefit greatly from being able to identify and compare particular schools, districts, and states, observe trends over time and demographic shifts, and create custom data displays from a wide variety of publicly available data. We hope that EdMaps will serve as a useful tool to help frame conversations on practice and policy, and the development of this tool would not have been possible without the knowledgeable and skillful staff at Blue Raster. To view the application, visit http://www.relmidwest.org/edmaps.